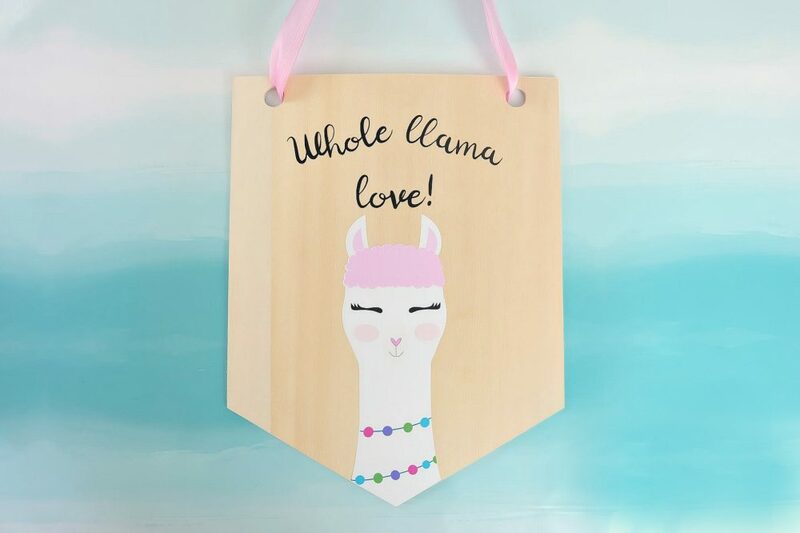 Learn how to cut basswood with your Cricut Maker and make this adorable DIY Llama Wood Wall Hanging featuring a cute Print and Cut llama and the quote Whole Llama Love! A few weeks ago my hubby and I decided it was time to make the leap and invest in an ipad and an Apple pencil for my business. I had always looked at an ipad as “one more thing” that I really didn’t need. I have an iphone I have an imac… do I really need an ipad too? The answer is 100% YES!!! I can tell you why the answer is yes in one simple word– Procreate. I’ve been taking part in SVG blog hops with some creative friends for 7 months and I’m always so impressed with the designs that they create. When I started asking them (and some other creative friends) how they make such incredible designs the answer kept coming back to “I use the Procreate app on my ipad with my Apple pencil.” I’ve been playing with my new setup for a couple of weeks now, and while I have so far to go still, what I love is that I can take any idea that’s floating around in my head, bring it to life and share it with all of you! I’ve been using the app a ton for the new book that I have coming out in the fall, and have used it for three projects already for all of you! 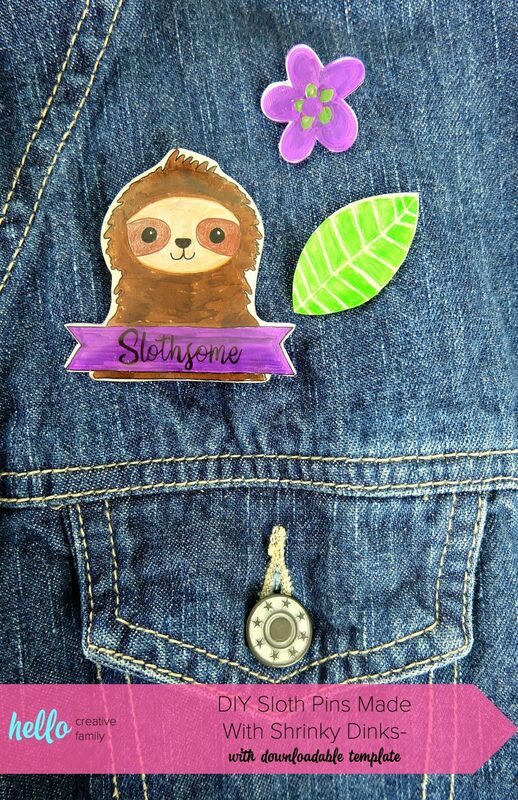 Today’s DIY Llama Wood Wall Hanging project, my DIY Sloth Flare Pins project from earlier this week and a Teacher Shark SVG that you’ll be able to download on Tuesday! 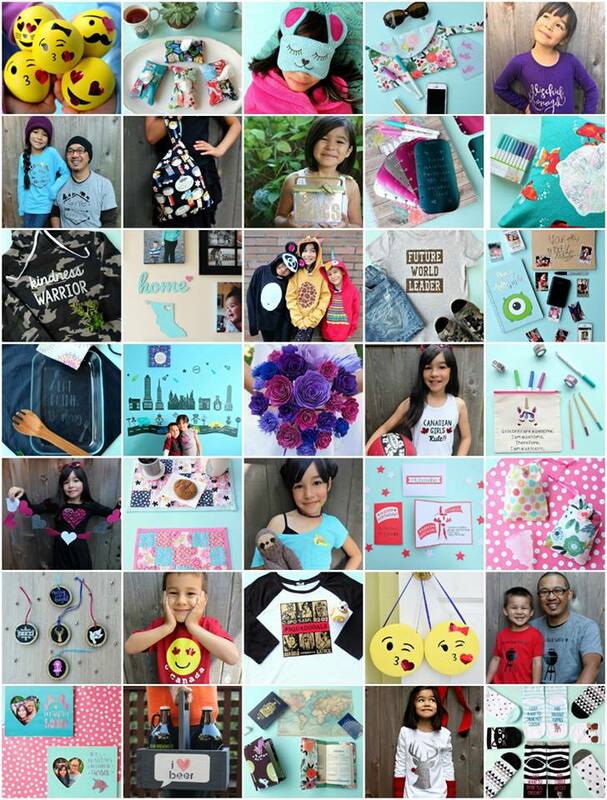 On Monday I’m going to be co-hosting Cori from Hey Let’s Make Stuff, #HeyLetsCricutStuff Instagram Challenge. 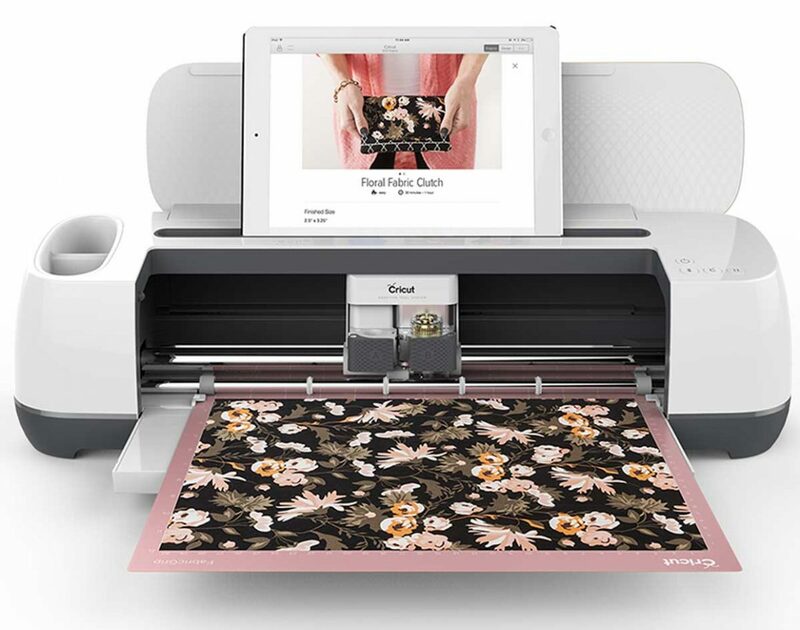 (Make sure you jump over to Instagram on Monday at 10am and check out our Hello Creative Family Instagram and Hey Let’s Make Stuff Instagram for a chance to win an awesome Cricut prize!)  The theme for the week is animals and since I already did a project with my favorite animal on Wednesday (the sloth), I thought I’d follow it up with a project featuring my second favorite animal today– Llamas. Image for personal use only. Please contact me if interested in purchasing for commercial use. I’ve got a whole llama love for llamas ;) and my kids do too, so I put that punny little quote on today’s project. I think it would look adorable on a family photo wall, decorating a bedroom wall or even hanging on a front door. Image for personal use only. I’m also super excited about this project because I had the opportunity to use Cricut Basswood for the very first time in it! The basswood cut like a dream. I considered painting it (which you may want to do) but I love that I could leave the piece “as is” so that the wood grain becomes part of the pattern in this project. Position your wood, chipboard, or other cutting material in the upper left hand corner of your mat. Speaking of time, you probably won’t want to set your machine and leave it. I highly suggest that you make sure you check your work every few cuts/do not leave your machine unattended. When your machine starts cutting, on the Cricut Design Space screen it will say something like “3 out of 12 cuts completed, 2o minutes remain”. If you are using a brand new knife blade it will cut faster than an older knife blade. For my first knife blade project I paused my machine at cut #6, peeled back the bottom tape and checked my work. The knife blade was so sharp that it had already cut all the way through my chipboard and I could see the shape I cut out in the mat. If I had left it for all 12 passes I’m sure it would have cut through the mat. You can check your work by using the pause button on the Cricut Maker machine. 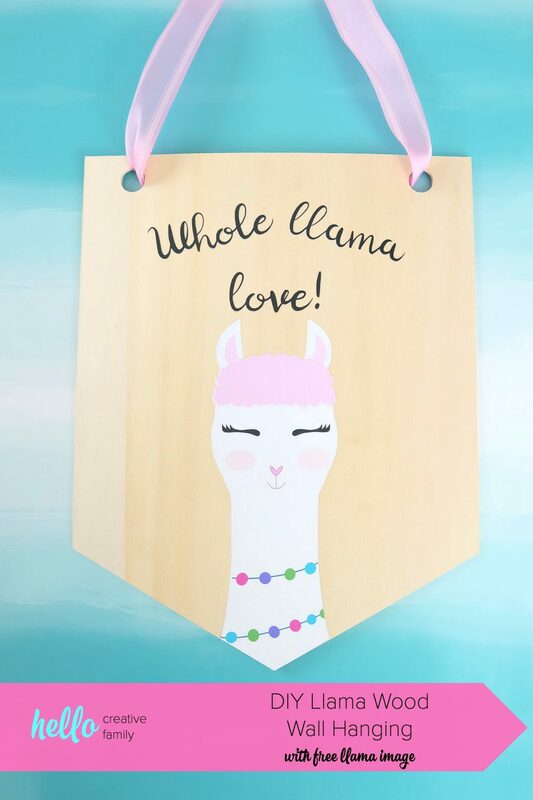 Ready to learn how to make my DIY Llama Wood Wall Hanging? Read on! Step 1: Uploading Images to Design Space- Right click on the llama image and Whole Llama Love image higher up in this post and save them to your computer. Log into Cricut Design Space and open my Wall Hanging Template. Click on “Upload Image” in the left hand toolbar. You will be using the llama as a “Print and Cut” image so select Complex as your image type and click continue. On the following screen you should see your llama with blue and white check boxes all around it. Click Continue. Click on the image on the right (The Print and Cut Image), name your image and click continue. 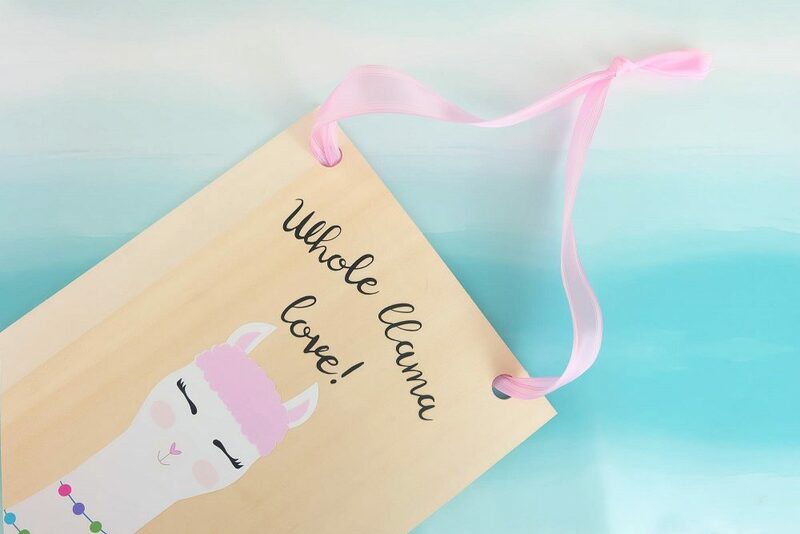 Repeat this process with your “Whole Llama Love” quote, however this time select your image type as simple, and your file as a cut image instead of a print and cut image. When you get to the below screen, click on the images you want to insert and then click “Insert Images”. Step 2: Prepping Images to Cut- Next you will want to size each of your cut files. You can do this either by clicking on each image and using the sizing arrows in the bottom right hand corner. Or by clicking the image and typing in the dimensions in the size box in the top toolbar. I wanted my llama to be triangular at the bottom so I decided to use the slice function so that the llama fit onto the bottom of the wood banner perfectly. I always duplicate each piece that I’ll be slicing first. Then lay your llama on top of where you will want it on the banner, select both the llama and the wood banner pieces and press the slice button in the toolbar on the right hand side of the screen on the bottom. Delete any pieces you won’t be using and then click Make It. 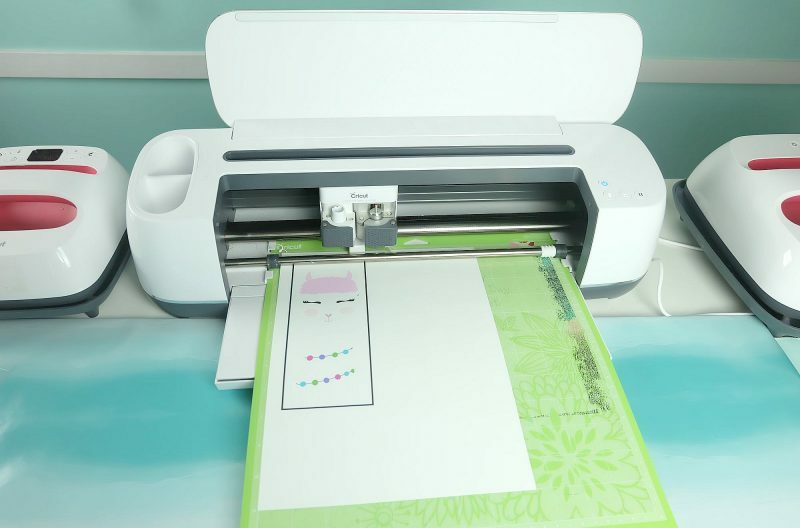 Step 3: Cutting- Print your llama design on the printable vinyl then put it onto the regular grip cutting mat, select Printable Vinyl as your material and have your Cricut Maker cut it out. Weed your llama removing the excess vinyl around the design. 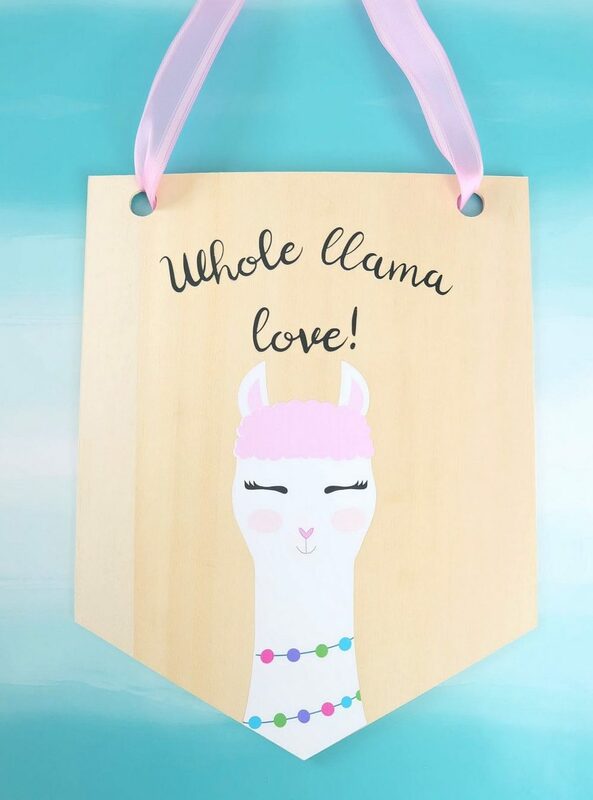 If using iron-on for your “Whole Llama Love” quote make sure to mirror the image first. 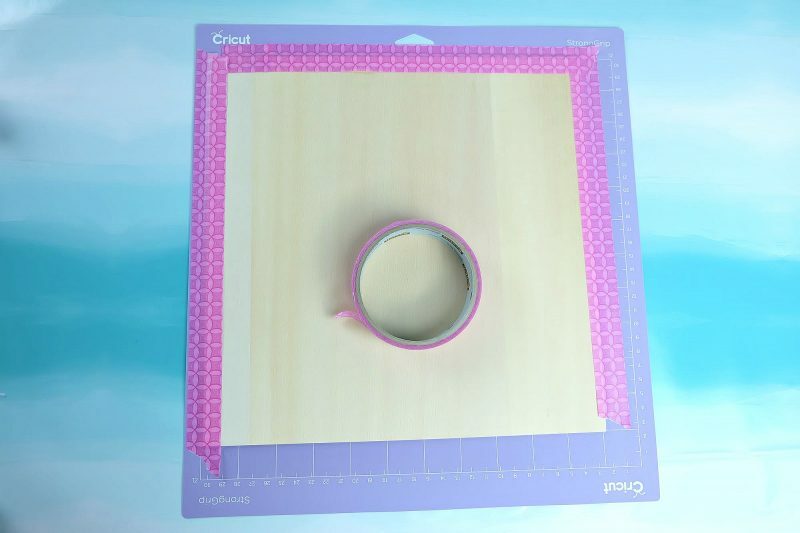 Position iron-on material with the shiny side down on your cutting mat and have the Cricut Maker cut it out. Weed your quote removing the excess vinyl around the design. For your Basswood, position the basswood in the upper right hand corner of your strong grip cutting mat. Tape the basswood down using painters tape or masking tape. Every so often pause your machine and check the progress of your cuts and see if the knife blade has already sliced all the way through. Step 4: Assembly- Using your Cricut EasyPress and the EasyPress Temperature Reference Guide adhere your quote to the basswood. Next position your llama on your basswood (you could use transfer tape for this, but since the design is relatively simple I chose to just peel and stick it like a sticker. Run a ribbon through the holes and hang! Voila! 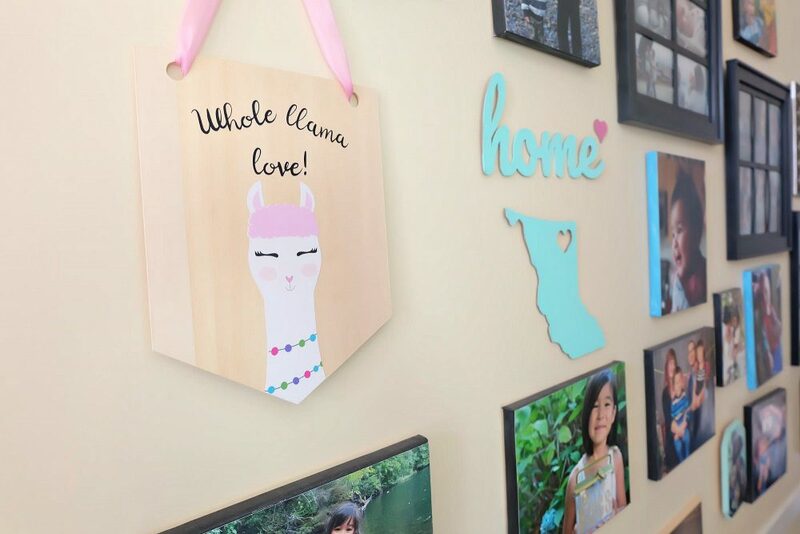 You have a beautiful DIY Llama Wood Wall Hanging! I think it would be super cute on a bedroom wall or even on a family photo wall! Tell me… Do you love llamas like my family does? Have you tried cutting basswood with your Cricut Maker yet? 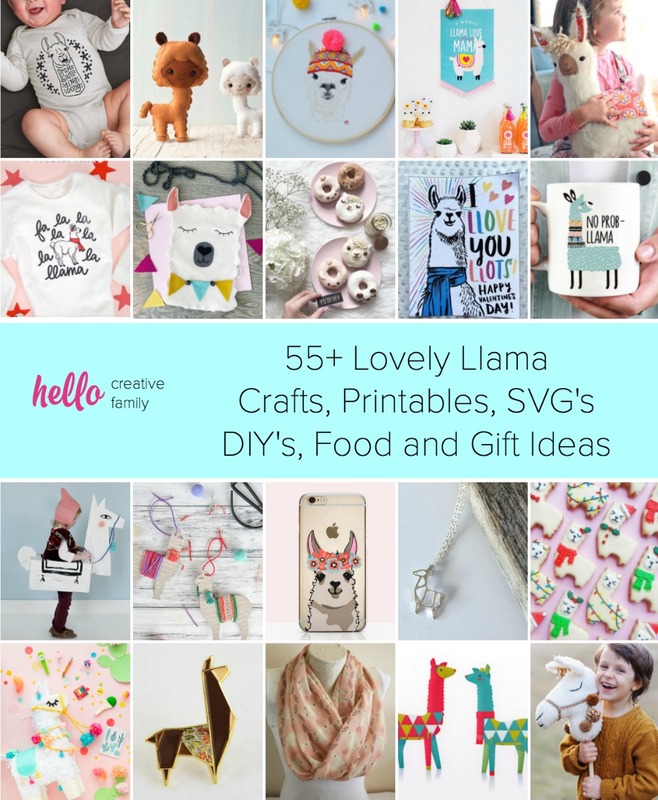 If you like this llama DIY we think you’ll like these ones too!